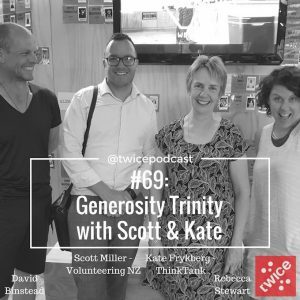 Here is the first of two podcasts on generosity where Scott Miller from Volunteering NZ and I are interviewed by the wonderful David Binstead from Twice Podcast. The total number of hours volunteering hours in Aotearoa NZ has dropped in recent years: how do we reclaim and reinvigorate volunteering? How do we know that the things we contribute our time or money to are useful, needed and impactful? How does philanthropy relate to inequality – is it a symptom or a cure?